Our product range includes a wide range of industrial universal bellows, weld end universal bellow and universal metallic bellows. Industrial Universal Bellows offered by us are highly appreciated among our client for their unmatched quality. With the support of our sound manufacturing unit, we are manufacturing and supplying a wide range of Industrial Universal Bellows using pipes and flanges. These are known for their unmatched quality and unbeatable price in market. Universal Metallic Bellows offered by us are highly appreciated among our client for their unmatched quality. 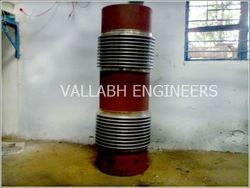 With the support of our sound manufacturing unit, we are manufacturing and supplying a wide range of Universal Bellows. 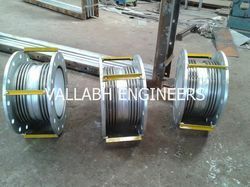 This Universal Expansion Joint Bellow consist TWO Bellow seperate by Center Pipe Piece. This Universal Expansion Joint Bellow can Take Axial and Lateral Moment. By Changing the Length of Center Piece We and Increar or Decrea lateral Moment as per our Techncial Requirenmet in Piping Joint.